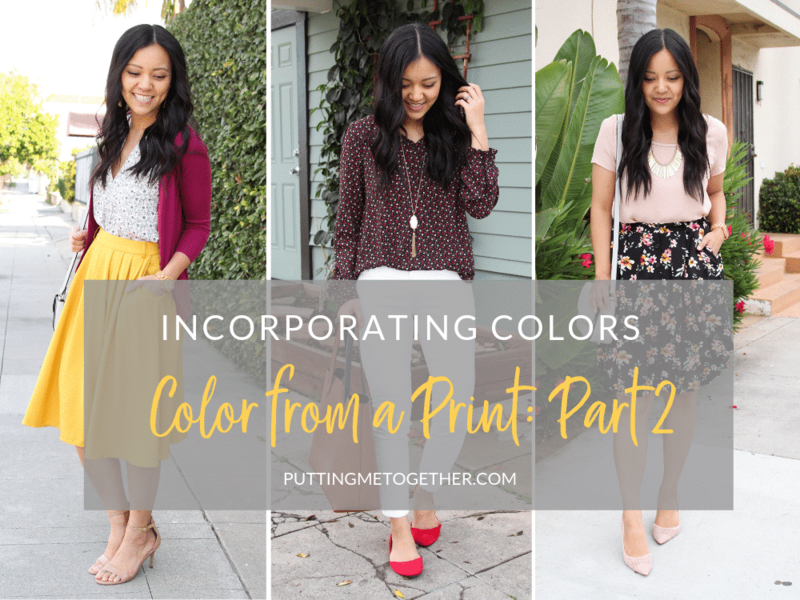 We’re back with Part 2 of how to add colors to outfits the easy way. If you missed Part 1 or want to see more posts on working with colors, check them out HERE! Last time we talked about wearing an outfit full of neutrals and adding one pop of color as a FOOL PROOF way to incorporate colors. 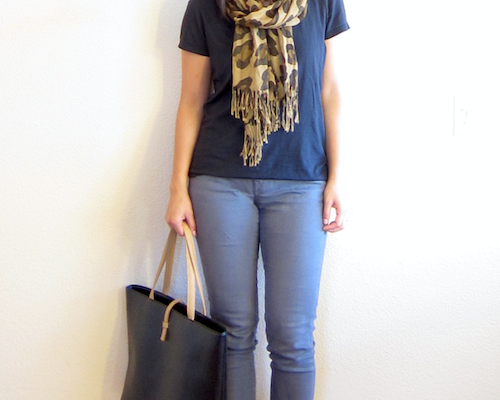 Today’s tip: Pull out color(s) from a print and use it elsewhere in your outfit. Start with a printed garment, like a top or skirt with a print. Then, build the rest of the outfit around it by choosing any color from the print and wearing something else in that color, like in your shoes, necklace, cardigan, etc. Sometimes a barrier to wearing more colors is simply not knowing which colors go together. With today’s tip, you still don’t need to know which colors go together–the print does the work for you! If you choose colors from the print, the print automatically ties everything together for you. It’s pretty magical! Okay, time to walk through examples. I’m just warning you right now that all of my examples of printed items are floral prints, hehe! I wear other prints like stripes, leopard, gingham, and polka dots, but they are all prints made of neutrals–or at least what I own. I know many of you say, “I don’t wear florals,” so if that’s you, try really hard to focus on the big-picture and less on the exact print. No matter what print you use, the main idea still works: pull a color from the print and use it elsewhere. This first outfit is an example of using only one color from the print. The skirt has pink, orange, white, black, and a little bit of green. I chose the pink family and used it in both my top and shoes. You could also do a green, black, rust orange, or white top, and you can keep the shoes neutral. Last year I showed this skirt with a black tank for a more casual summer look HERE. I got this skirt last year, and I’m SO glad it’s fully back in stock! It’s lightweight and airy but fully lined. It’s got POCKETS, cute button details down the front, and elastic at the sides of the waistband. For sizing, despite the elastic, I feel this runs quite small. I bought it last summer in size M which is my usual size at ModCloth. The timing was pre FASTer Way to Fat Loss, and I was about 3 months postpartum, and the medium was super snug. I kept thinking, “Once I lose more baby weight it’ll probably be fine.” Well, you all know I’m about 15-17 lbs down now thanks to FASTer Way and back to my size from 5+ years ago (before having any kids). And now? This skirt JUUUUUUST fits. If I could redo it, I’d give size L a try, especially since ModCloth offers free return shipping! Would have just bought both sizes and returned the one that didn’t work for free. Anyway, keep that in mind. Otherwise, this skirt is one of my favorites! It’s available in sizes XXS to 4X HERE. The second outfit shows how you can pull out two “colors,” with one being a color while the other is a neutral. The print has black, red, coral, and a sort of cream or beige type of tone, which I just lumped into the “white” family of colors. I pulled out the red from the print and used it in the red flats. I also pulled out the white and used it in my necklace and the jeans. 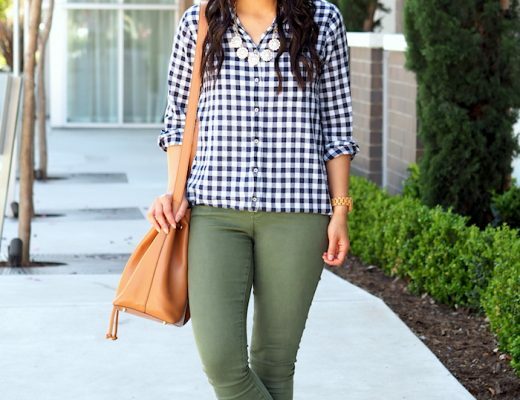 You can totally do this with regular blue jeans + the red flats too, but if you are looking for ideas to mix up your outfits, then try choosing pants in a color from the print! Another way you could pull out color is by wearing a navy skirt instead of the yellow one, or a blue or navy cardigan instead of the magenta one. You could also do a pink skirt. 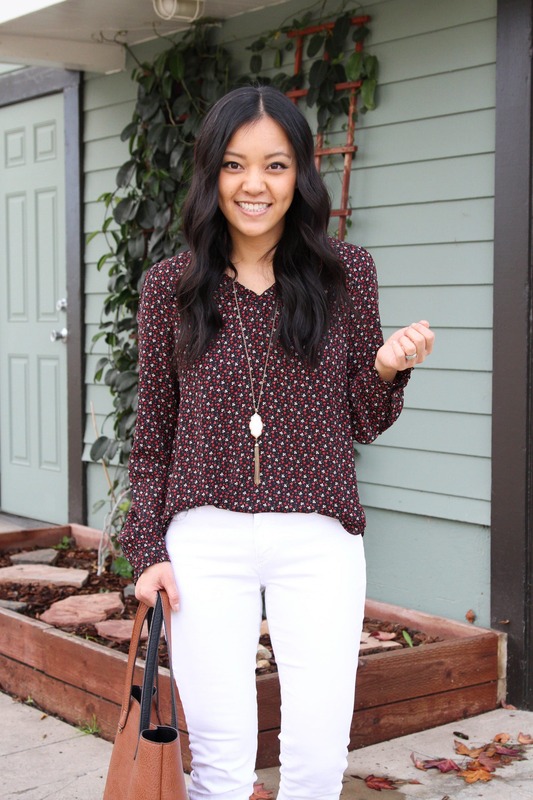 The possibilities are plenty when you’re working with prints, which is why it’s so fun to have some in your closet! On that note, here are some fun printed pieces you could consider adding to your wardrobe! When you play with color, do you tend to use 1) just one color with the rest neutrals, 2) a color and neutrals, or 3) multiple colors? 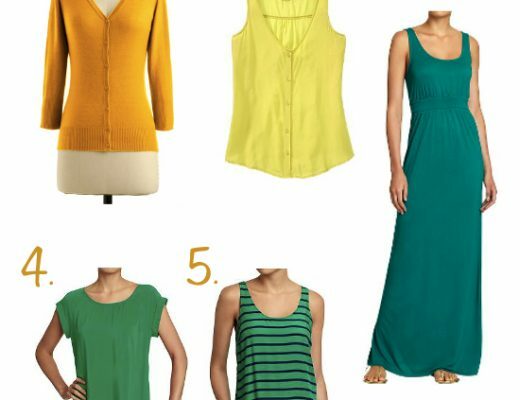 Fashion Finds – Summer Yellows and Greens. And a MUSTARD CARDI!